Iris House was given the keys to a derelict building in December of 2014. After four months of intensive repair work by volunteers, staff and families of Iris House and the amazing support of professional contractors who either donated their services or charged an absolute minimum fee. Iris House proudly opened their phase one Respite Day Care service on the 14th of April 2015. Iris House is the first Special Needs Children’s Hospice of it’s kind in South Africa. 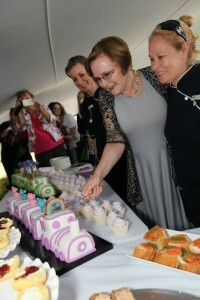 The event was officiated by Premier of the Western Cape – Helen Zille with special guests Clive Rice and his wife Sue. Iris House respite day care is now open to families for three sessions per week, Monday’s and Wednesday 9am to 4pm and Saturdays 9am to 1pm. Each session is client focused and offers FREE quality care, play therapy, Physiotherapy, and life skills. Every child and young adult has their own carer to ensure the highest level of care. Sessions are planned by our Playmaker Marleen, focusing on each child’s ability. Medical needs are taken care of by a senior carer who is responsible for each child’s wellbeing whist at our sessions. Each session has a maximum of six children so as not to over crowd our playroom. Children are grouped by ability not age, the day is planned using a visual schedule so children can fell completely at ease. A wet room is available for changing and personal hygiene. Our state of the art sensory room (donated by Rotary Oostenberg) provides relaxation and or stimulation for children, who can enjoy up to 20 minutes in the room at a time. There are never more then two children with their carers in the room at any given time. We have a raised floor with speakers inside so children can “feel” the music. A top of the range projector, Apple TV, I pad, Black light, disco ball and light show. We have also got a bubble tube on order. For children needing calming we have weighted jackets and blankets on hand. The raised floor is covered with high quality gym matts providing comfort and safety. Our playroom is fully equipped with sensory toys, fine and gross motor skills developmental equipment, TV and DVD, Ipad, Dress up corner, reading corner and comfy coaches. Our beautiful mural created by Mom Cezaane Halligan- Jolly sets the tone of the fun, family feel to the room. We are hosting an open day on the 3rd of May 2015 for our families , from 11am till 1pm.We look forward to seeing you soon at our Hospice!